On June 6th, 2015 from 10pm- 5am, 324 Okeechobee county students were entertained at the 26th annual Okeechobee County Grad Night event. The Tobacco Free Partnership of Okeechobee County members along with current SWAT club members were on site all night long to engage with students about the harmful effects of tobacco and ways to quit this nasty habit. Students and adults were offered information about different types of tobacco that is being used the three ways to quit program. This event celebrates the beginning of a new path in life for these graduating seniors and what a better way to start that path than becoming free from the tobacco addiction! Grad Night is organized by a local committee and supported by The Okeechobee Educational Foundation, Kiwanis Club of Okeechobee, Okeechobee Rotary Club, and the Children’s Services Council of Okeechobee. For the second consecutive year. 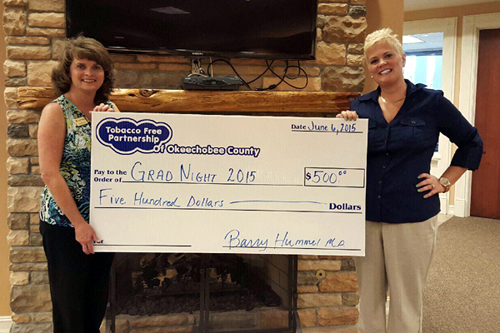 the Tobacco Free Partnership of Okeechobee County was honored to help sponsor the event. Grad Night begins one hour after the high school graduation ceremony ends. The event is held at the Okeechobee KOA convention center. Graduating seniors attend the event with a pre-approved guest of the choice. As always this event is drug, alcoholic, and tobacco free. Upon arrival each student is checked in and given a wristband, the students are not permitted outside of the building during the entire event, and they are not permitted to leave the event and return.